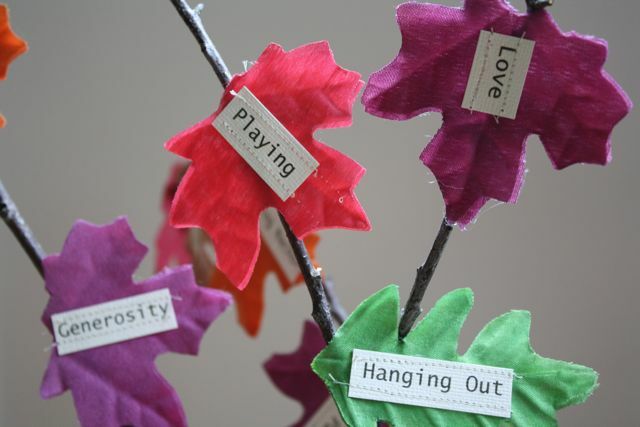 It’s easy to get lost in the hustle and bustle of the holidays, but this Gratitude Tree is a wonderful way to slow down and count your blessings! As we head into November, I wanted to make a very visual reminder of some of the simple things our family is thankful for. 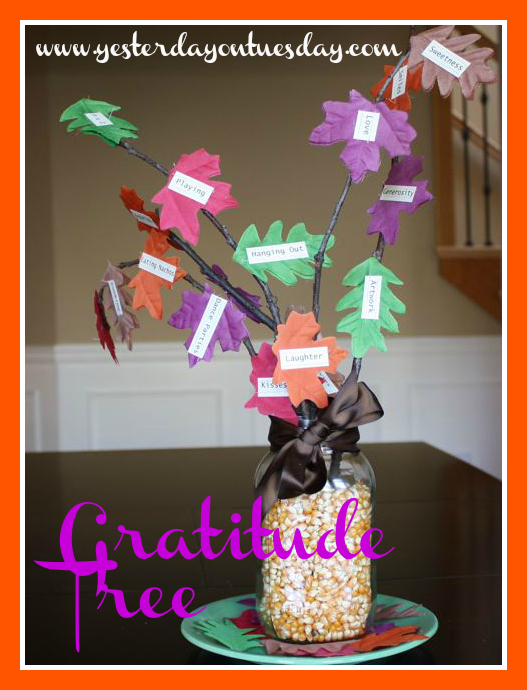 This is an easy project you can do with your kids– a Gratitude Tree. 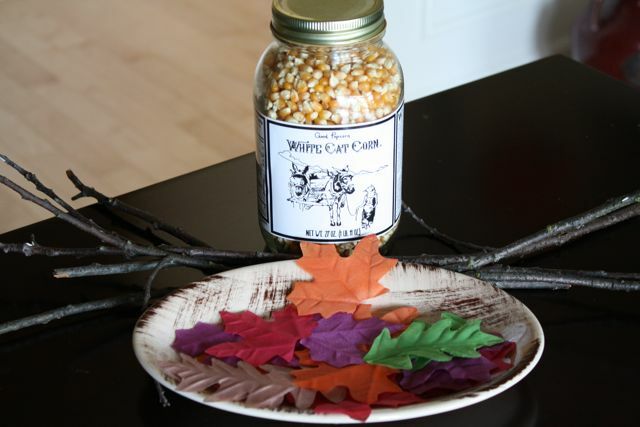 Supplies: Silk Leaves (from dollar bin at Target), twigs, popcorn kernels, glass jar and a sheet of cardstock or construction paper. Also need a glue gun and (optional) a sewing machine. Grab your kids and come up with a list of words that describe your family– qualities you strive for and things you like to do together. 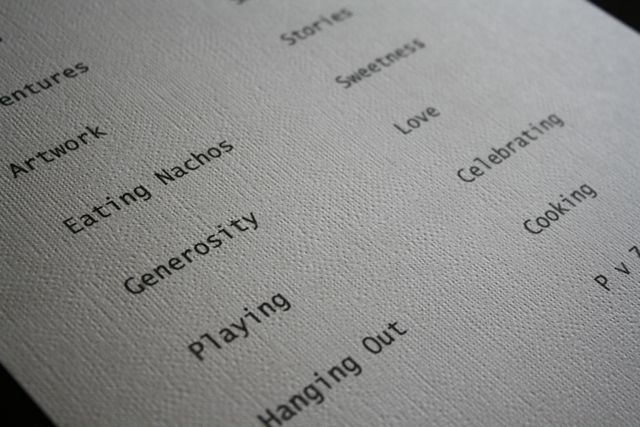 Handwrite the words or print them out on cardstock or construction paper. 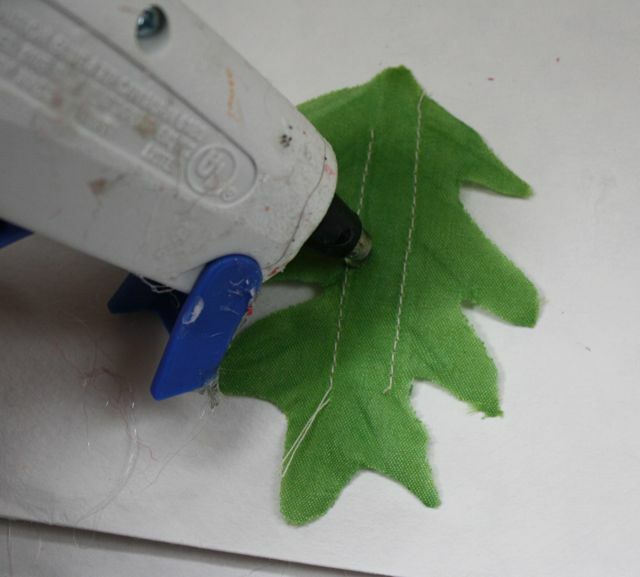 Use the glue gun to attach a “back” leaf as well. Here are the leave before I attached them to the twigs. Kind of cute like this too. This is super cute Malia! And I have to say, I love your idea for managing your link ups. I may have to borrow this idea from you! Hope you had a fun night of trick or treating! This is so sweet! Thanks for Sharing Malia! I love it…what a great idea! What a nice, festive way to get the kids involved! Thanks for checking in :) I am feeling good, just tired. I have a long list of things to blog too! Ok, love it. 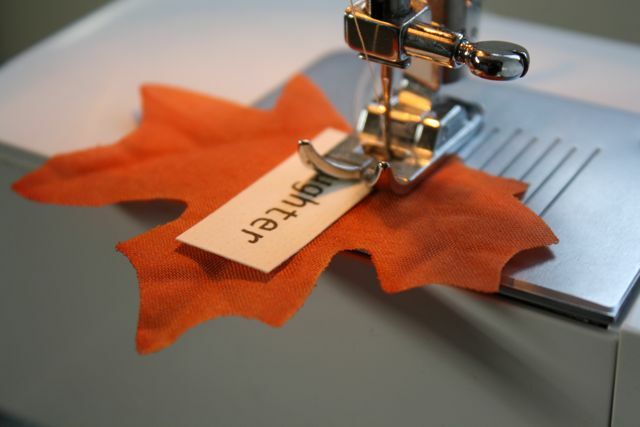 Wish I had a glue gun and for sure there is no sewing machine around here. Ha! Oh yesterday on Tuesday, how I’ve missed you! Sorry I haven’t been to visit in a while. Wow! 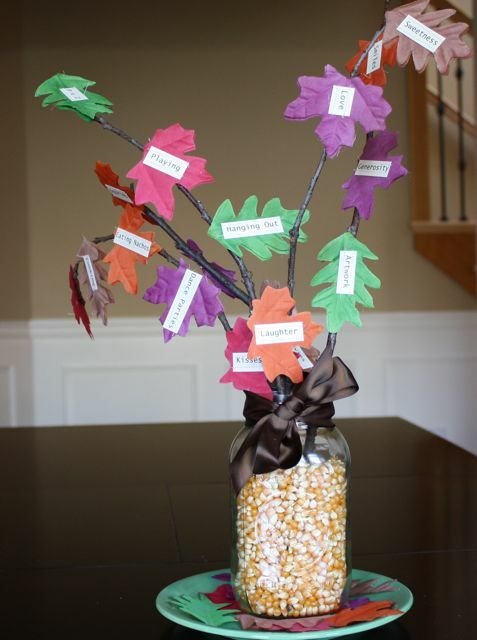 This is such a great idea, I’m going to work on it with Anika, and make all our guests add to the tree when they come for Thanksgiving! I look forward to seeing your projects on Monday! 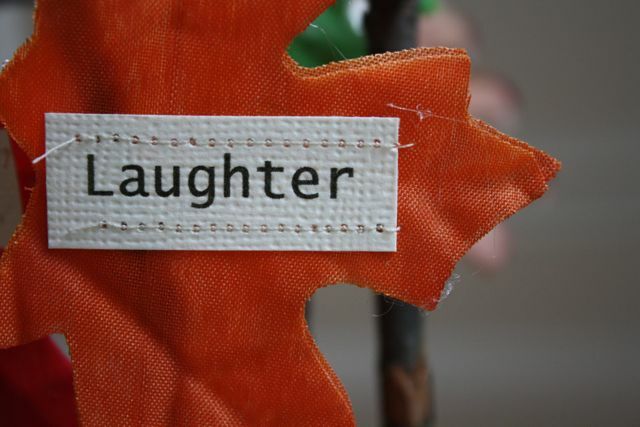 You definitely blog some super quality crafts, and I love this one just as much! This is really cute! Great job. Looking forward to seeing more. What a great idea! I am loving all of these Thankful projects! So pretty! I love the colors and the idea to use corn in the base. Awesome idea. You are just oozing of creativity it kills me! Thank you for sharing, going to forward to my friend with kids. 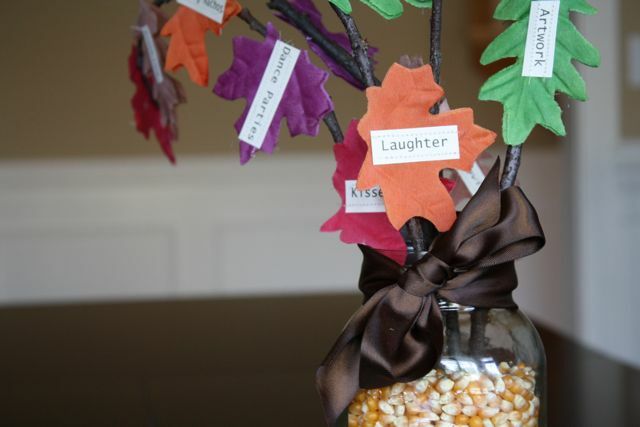 Love this idea and I need a new table centerpiece since Halloween is over! This is a fantastic idea! I love it! I would love for you to link this up for a chance to win my Get Organized Giveaway! Such a great idea-thanks for linking up! I like how it is a reminder for the kids (because they wrote the words) of just how blessed they really are. This idea is amazing. Every year I want to do something like this, but never quite get it together. Fabulous job! Love! 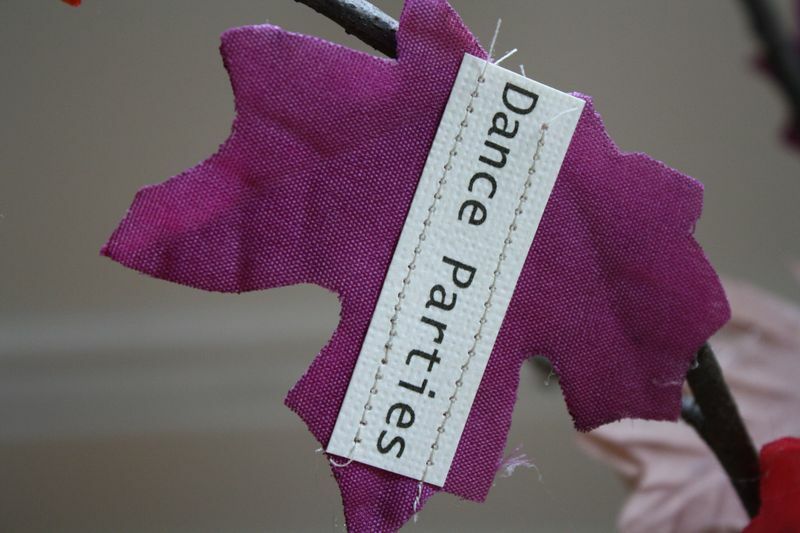 And I’m impressed that you sewed the tags on! Stitches are just part of the detail I love.